Since 1971, SunMaster Products has provided countless numbers of satisfied San Diego County residential, commercial, and industrial clients with stylish, exceptional quality retractable awnings at very competitive prices. At SunMaster, our highly skilled, experienced craftsmen pride themselves on adhering to only the highest standards of workmanship, and build our retractable awnings to be both durable, as well as to function beautifully for years to come. 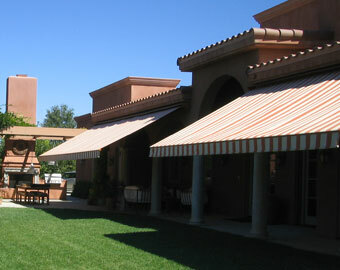 Our retractable awnings can be covered in an extensive selection of fabric types, colors, and patterns, including the full line of Sunbrella 100% solution dyed woven acrylic fabrics, and all framework is available in a choice of over 100 powdercoat color finishes – with a shade certain to complement any residential or commercial property's exterior. In addition, we can also repair and refurbish existing retractable awnings: We can install replacement parts such as lateral arms, replace faulty automatic control systems, perform awning recovering services, and also repowdercoat existing awning framework, granting these awnings a whole new lifespan. At SunMaster, we are a family-owned and operated business that can custom-design, craft, and install any style of retractable awning imaginable for your home, business, or industrial or institutional facility. We offer our retractable awnings in both manual, crank-operated designs as well as designs which feature the latest, state of the art motorized automatic control technology. 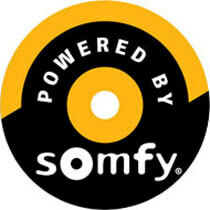 As an authorized Somfy dealer, we can outfit our retractable awnings with their full line of motorized remote control operating systems, timers, wind sensors, and sun sensors. Somfy is an acknowledged leader in the development of innovative retractable awning automation systems, and stands behind their high quality motors and controls with a 5 year warranty. Call SunMaster today to schedule a free onsite design consultation and estimate on a retractable awning for your home or business property. You are certain to be delighted by our affordable pricing, fine quality craftsmanship, and superior customer service. Can be covered in a wide array of fabric types and densities, in an extensive selection of colors and patterns. Framework can be finished in over 100 powdercoat finish colors. All electrical work performed by licensed electricians. Offered with manual crank, remote control, Z-Wave, or hardwired switch operation. Available with sun and wind sensors – for optimal functionality. Can be engineered to extend up to 12 feet out from a structure. Awning component replacement, including lateral arm and automatic operating system replacement. Awning recovering, in a wide array of fabric types, colors, and patterns – to make existing awnings look like new. Framework refinishing, in a choice of over 100 powdercoat color finishes. Retractable patio covers allow our customers to adjust their awnings to provide the desired amount of sun exposure. We installed this Sunbrella retractable awning for a Carlsbad home to protect its western exposed balcony from excessive sun exposure. 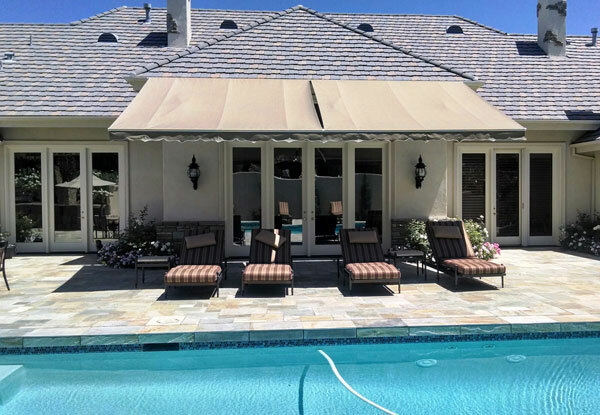 This Sunbrella retractable patio cover in San Marcos, CA provides shade for poolside chairs and protects the home's windows from harsh UV rays. Retractable awnings can be adjusted to provide the desired amount of shade or sun exposure. 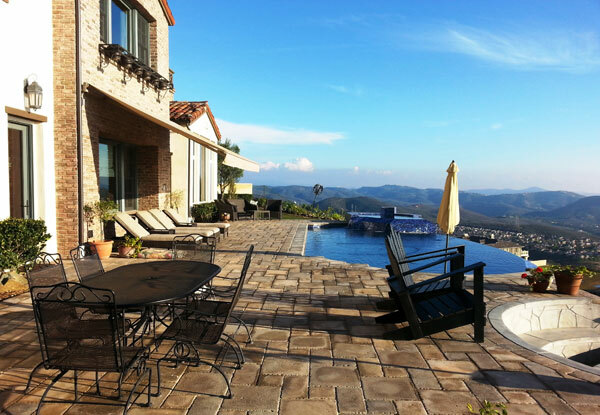 SunMaster installed this retractable patio cover in Vista, CA. Our retractable awning provides sun protection for the home and poolside shade for its guests. 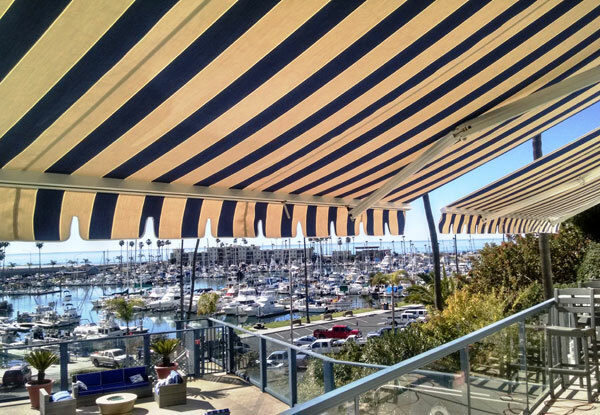 This condo in Oceanside, CA features Sunbrella awnings installed by SunMaster. Our retractable patio cover provides sun protection and shade for the balcony on the building's recreation room. Retractable patio covers are an excellent solution for outdoor shading and window protection. 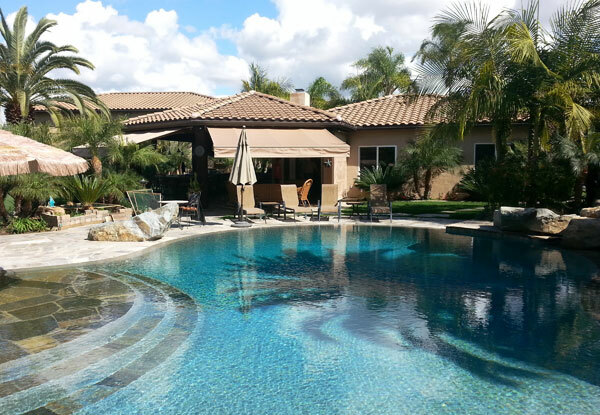 This retractable patio cover in Rancho Sante Fe, CA provides shade for this home's outdoor pool area. 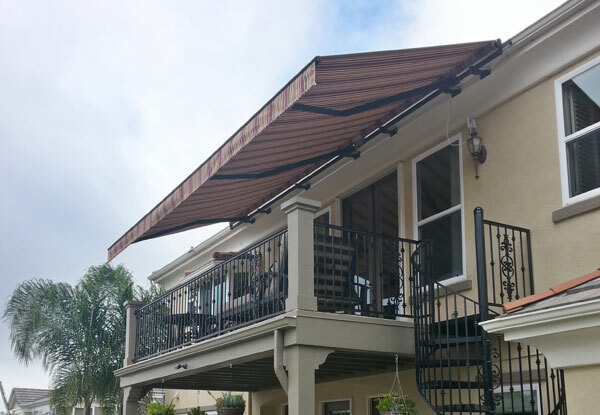 We used Sunbrella fabric to provide our client with a durable awning to compliment their home.